This is the best jam I've made so far! It is so good. The plums produce a striking beautiful colour and the taste is delicious, the rich tangy flavour of the plums is just wonderful with the right hint of sweetness from the sugar and I only used half the sugar calls for. Place whole plums in deep pot, cover with water and leave to boil. Remove the pips or stones as they rise, or simply 'look for it' and discard. Add in sugar and simmer till it reaches setting point. This is fairly easy to make, but be prepared as the whole cooking process takes about one and a half hours. Additional pectin is not needed as plums are rich in natural pectin. If you have a candy thermometer, feel free to use it. I did not use the thermometer, I just rely on how thick or runny that I like my jam to be. One thing to remember is, once cool, the jam will set a little bit more. Four jars of delicious plum jam! Kept one for myself, the rest given to members of my family. Really good on a slice of bread spread with some butter. The jam is really good with freshly toasted bread and a cup of tea! 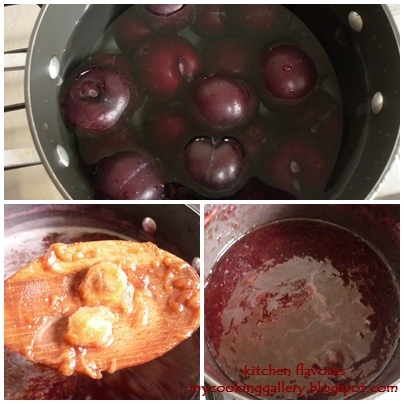 Put the plums in a preserving pan and pour in the water. Bring to the boil. Reduce the heat and simmer gently until the damsons are soft, then stir in the sugar. Bring the mixture to the boil, skimming off stones as they rise. Boil to setting point (105C/220F). Leave to cool for 10 minutes, then pot in sterilized jars. Seal, then label and store when cool. It has been raining rather heavily towards the late evening almost daily for the past three weeks or so. A bowl of hot curry eaten with plain white rice is just what I need! This is a very tasty curry dish and if you love chicken curry, then I think that you would love this. 1 cinnamon stick about 3"
Cut chicken to pieces for curry, remove skin and fats. Heat oil. Fry cinnamon stick, star anise, cloves, curry leaves and sawtooth coriander leaves over low heat till fragrant, about 1 minute. Add pounded garlic and ginger, fry for about 30 seconds, then add in the onions and tomato. Stir for about 2-3 minutes. Add in the spices, stir for about 15 seconds. Pour in half a cup of water, stir till evenly mixed. Stir in chicken pieces and salt, stir till chicken is evenly coated with spices. Pour in the remaining water, stir, cover and let boil for 5 minutes. Test for salt. Add in potatoes, and if curry appears dry, add about 1/4 cup of water or to desired consistency. Let simmer, stirring occasionally, till chicken is cooked and the potatoes are tender. Curry should be fairly thick with some gravy. Garnish with thinly sliced sawtooth coriander. Serve with hot white rice. Enjoy! I saw this cake over at Louanne's Kitchen, where Louanne and five other foodie pals got together to form a group who are baking from Barefoot Contessa's recipes. Ina's Garden was created by these six lovely ladies, and this Orange Pound Cake was the first recipe which is the kick-start for this new blog hop. For more info on this new group, please drop by Louannes' Kitchen for the full details. I have never tried baking or cooking from any of Ina Garten's recipes before, this is a first one for me. In fact, I have watched her shows and seen some of her cookbooks, but have never attempted to try any before. So this cake is a perfect one to start with. This is a lovely orange pound cake. It is so soft, moist and full of orange flavour. It is good on the first day, even better on the next day! The recipe makes 2 loafs of cake. I only make half the recipe. The original recipe can be found at here , from food.com. 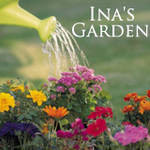 I'm linking this with Ina's Garden over at Louanne's Kitchen, check out what's next on Ina's Garden over at Louanne's. Butter and flour 2 loaf pans. Mix in eggs, one at a time, add zest. Sift in flour, baking powder, baking soda and salt together. In another bowl, mix 1/4 cup orange juice, buttermilk and vanilla. Add flour and buttermilk mixture alternately to the batter, beginning and ending with flour. Divide between 2 pans and smooth the tops. Bake for 45 minutes or until tester comes out clean. Make the syrup while cake is baking. Syrup consists of remaining 1/2 cup sugar and 1/2 cup orange juice. Cook these together over low heat until the sugar is dissolved. Spoon over cakes and then allow them to cool completely. You may glaze these cakes (after cooling) with a simple glaze but I don't usually. ~ I use baking pan size 8inx5in for half the recipe. ~ I substitute the buttermilk with homemade yoghurt and milk, for 3/4 cup buttermilk substitute with 1/2 cup yoghurt mix with 1/4 cup milk. ~ I reduced the sugar and it is just right, with the right amount of sweetness. ~ I rub the sugar with the zest until the sugar is aromatic and is a lovely orange. ~ Before pouring the syrup over the cake, I poked the cake all over. Do not skip this syrup, as it really makes the cake moist and full of orange flavour. Lena from Frozen Wings has invited Kitchen Flavours to join in an Easter Party by suggesting 5-10 recipes, upload the photos with respective links. We are supposed to tag 10 other bloggers to do the same, but since this is a rush, I'm just gonna join in the party and bring these along to the virtual party! Slicing into this bread will reveal the hidden treasure inside! Two rolls of delicious sausages takes center stage in this savory loaf of bread. The addition of sage gives a light herby aroma. It has a lovely crust and to enjoy it to the fullest, eat it while still slightly warm. This bread is good on the first day, it is not as soft and fluffy as the Fresh Tomato and Basil Loaf on my earlier post, but it is soft enough. I find that this bread is not a good keeper, on the second day, it has gone a little stale. Since it has the sausages as its filling, it is advisable to finish the bread by the second day. I could not find any Mediterranean sausages, so I use black pepper sausages, really good too! So if you intend to have this bread for dinner or late supper, make this in the afternoon, and you will enjoy it at its best, on the day it is baked. Heat the oil in a heavy frying pan. Add the sausages. Fry them over a medium heat for 7-10 minutes or until cooked, turning frequently. Cool. Add the eggs and water to the bread pan. 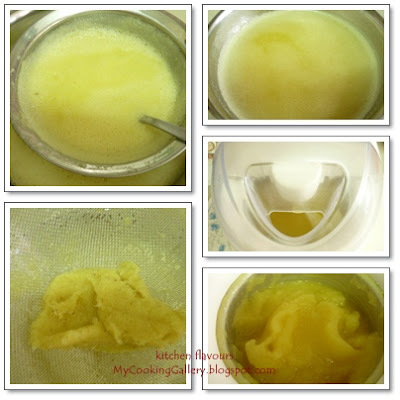 Reverse the order in which you add the wet and dry ingredients if necessary. Sprinkle over the flour, covering the liquid. Add the milk powder. Place the sugar, salt and butter in separate corners of the pan. 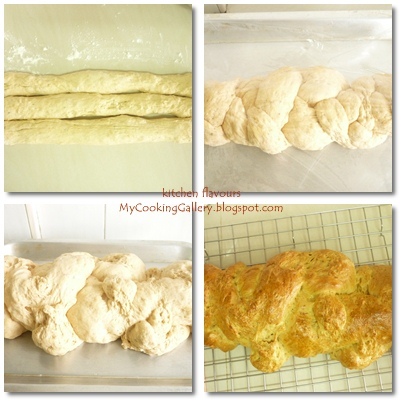 Make a small indent in the centre of the flour, add the yeast. Set the bread machine to the dough setting; use basic raisin dough setting (if available). Press Start. Add the sage when the machine beeps or during the last 5 minutes of kneading. Lightly oil a 23x13cm/9x5in loaf tin (pan). When the dough cycle has finished, place the dough on a floured surface. Knock back (punch down) gently. Roll into a rectangle 2.5cm/1in x 23cm/9in. 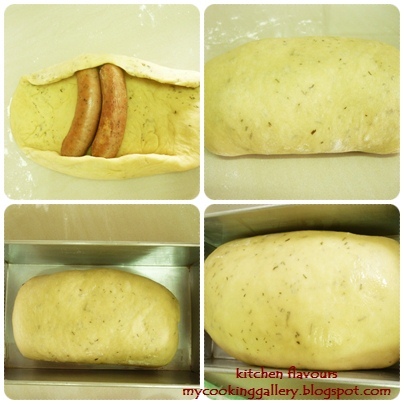 Place the sausages down the centre and roll the dough tightly around them. Place in the tin. Cover with lightly oiled clear film (plastic wrap) and leave to rise in a warm place for 30-45 minutes. Preheat the oven to 190C/375F/Gas 5. To glaze, mix the yolk and water, brush over the bread and bake for 30-35 minutes, or until golden. Turn out on to a wire rack to cool. Soft, fluffy and good! Extremely easy to make. Made this for breakfast and the kids enjoyed these with some warm blueberry sauce. I will be making this again, yummy with some strawberry sauce or honey and would be fantastic with chocolate sauce! 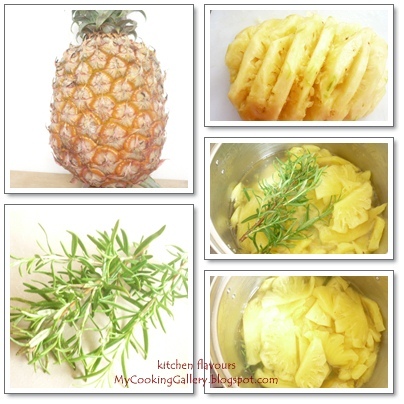 I got this delicious recipe from Allrecipes.com , a great site to look for home recipes. Combine flour, sugar, baking powder, baking soda and salt in a large mixing bowl. Whisk egg and pour into "soured milk". Pour the flour mixture into the wet ingredients and whisk until the lumps are gone. Heat a large skillet over medium heat, and coat with cooking spray. Pour 1/4 cupfuls of batter onto the skillet, and cook until bubbles appear on the surface. Flip with a spatula, and cooked until browned on the other side. 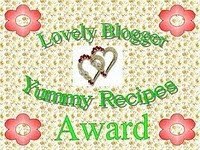 These lovely awards are from two wonderful foodie friends, Jay of Tasty Appetite and Love2Cook. Thank you ladies, for forwarding these awards to me, I'm honoured! Some of you may already know these two wonderful blogs, if you do not, then do stop by their wonderful sites. They have wonderful delicious yummies both in their cooking pot and in their baking pans! 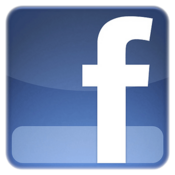 Once you pop over to their site, you will surely be back again visiting! Thank you again, Jay and Love2Cook. I'm addicted to cookbooks! But then, who doesn't?? I love watching "The Power Puff Girls" and "Tom and Jerry".. are you laughing?? I try not to watch sad story on TV, they make me cry.. I love coffee AND tea! Stayed near the beach until I was fifteen, but never knew how to swim!!!! The first book that make me cry when I was eight, "The Little Match Girl" by Hans Christian Andersen. I read my first "Mills & Boons" when I was eleven, WOW! and never look back! 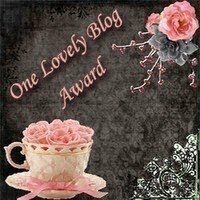 Do visit these fantastic blogs, they are all truly wonderful! Salted duck eggs, are a favourite among the Chinese, though now it is commonly eaten by others too. These salted eggs are sometimes sold, covered with a thick layer of charcoal salted paste. For homemade salted eggs, we soak the eggs in prepared brine solution. Salt is boiled with some water, left overnight till completely cool, then the whole eggs are put into a glass jar, covered with the salted brine, the jar is then covered lightly with a slight opening gap, and leave to preserve, undisturbed in a cool, dark place for 21 days. These are hard-boiled salted eggs. Really good as a side condiment with congee. At the end of 21 days, I would usually test an egg to check whether they are ready to be eaten. An egg is taken from the jar, rinse it clean and boil it in plain cool water for about 10 minutes, same as the regular hard boiled eggs. Remove it from the boiling water and let cool to room temperature. Once cool, cut the egg in half lengthwise, the yolk should be orange red, a little oily and firm. The white part would be more saltier than the yolk. If the whole yolk is pale in colour, then the eggs are not ready, and need to be preserved a little bit longer, maybe another few days or so. The oiler the yolk, the tastier it will be, then you will know that you have been really successful at making homemade salted eggs. Make sure the eggs are completely submerged in the brine solution. I placed a small teacup to keep the eggs in place as they tend to float to the surface. Keep it covered, leaving a small gap to allow air to circulate. Place the jar in a dark and cool place, undisturbed, and leave for 21 days. Salted duck eggs can be boiled or steamed, still in their shell, and once cooked, peel off the shell and can be eaten with congee and also be used to prepare other Chinese dishes. Salted eggs are usually prized for their yolks, the deeper the colour and more oily it gets, the tastier it will be. During the Mooncake Festival, the price of salted eggs would usually increase, as the yolks are used to represent the moon in the mooncakes. The white part of the raw salted eggs would be runny and clear, whereas the yolk would be a bright orange-red and firm. The raw yolks can be mashed and use to flavour soups along with the whites. I have made Salted Duck Eggs many times and have given most of the eggs away to my sisters and friends. Salted duck eggs are high in cholestorel and sodium, therefore this is not consumed frequently. We only have this once in a while, and at moderation. Usually an egg is shared by two persons, each gets a half! Even though chicken eggs can be used, duck eggs are preferred for its richer and creamier taste. There are many ways of using salted duck eggs, either in savoury cooking or sweet desserts. I will be posting some recipes using salted eggs when I do use them. Have you eaten salted duck eggs before? Place salt and water in deep stockpot and let boil till most of the salt dissolves. Tip, if the brine is salty enough, the salt won't dissolve completely, you can still find the salt grains in the pot. Let cool completely, preferably overnight. Wash eggs clean, gently scrub the shell to remove dirt. Wipe dry and place in a glass jar. I would prefer to use medium sized eggs rather than large, as it takes a shorter period of time to preserve them. If you're using bigger sized eggs, increase the preservation by another 3 to 4 days. Place a sieve over the jar of eggs, and slowly pour the salted brine solution into the jar until the eggs are fully submerged in the solution. Because of the density of the salt, the eggs will float. Place a mug or a small bowl over the top of the eggs to submerge the eggs in the solution. Cover the jar loosely, leaving a gap for the air to circulate. Leave in a cool, dark place, undisturbed for about 21 days. At the end of 21 days, there are two ways to check whether the eggs are ready. First method is to break open the uncooked salted egg, the whites should be clear and runny and the yolk should be firm that you can lift it up with a spoon and the colour is orange red. Now I prefer the second method, boil it in an open small pot for about 10 minutes, let cool to room temperature, unpeel or just cut it across lengthwise, the yolks should be orange-red and a little oily. If the yolk is really pale, leave the rest of the eggs to preserve for another 3 days or so, and do the test-check again. Do not allow the eggs to soak in the brine solution for long periods as they will get saltier the longer they sits in the salted solution. Once the test check is done, and the eggs are ready, simply drain them dry in a colander and place them in a covered container, and store them in the fridge. Over the weekend, my sister came for a visit and she brought over two tubs of frozen chicken stew for my kids, cooked by her. Yesterday, being a school day, I am undecided about what to prepare for the kids' after school meal. Her chicken stew came to mind along with a crusty fresh loaf of bread. I just need to make the bread and reheat the chicken stew, perfect, that would give me some extra time to 'spring-clean' my son's room, stuffs like clothes and toys that he has outgrown, will have to go to the recycle centre. I have been putting this off for so long now. Her chicken stew is so delicious! I would have to ask her to cook this again, invite us over, and I'll bring the bread! Found this lovely recipe from my current favourite bread making book, "Bread Machine". 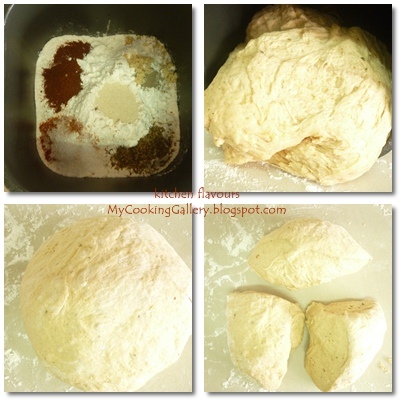 Everything goes into the bread maker, let it do what it is best at, kneading, then take the dough out, punch it down, round it, and divide into three equal sizes. Roll the three pieces of dough into long ropes, braid them together and place onto lightly greased baking pan, cover with lightly oiled clear film and leave to rise. Uh-oh, look at the braid, it rose so much that the braids has mis-shapen! It is definitely not a pretty braid! Ha! Ha! Brush the top with some egg glaze and bake. It is so good! It is crusty on the outside and soft inside. This is so good with the delicious chicken stew! This bread is a little spicy from the paprika powder, cayenne powder and black pepper, but then my kids are not complaining. They love it! Between the two of them, they finished half the braid! This is another winning bread recipe from Jennie Shapter! Pour the water and vegetable oil into the bread machine pan, then add the tomato puree. If the instructions for your machine specify that the yeast is to be placed in the pan first, reverse the order in which you add the liquid and dry ingredients. Sprinkle over the flour, ensuring that it covers the liquid. Add the paprika, cayenne, oregano, black pepper and crushed garlic. Place the salt and sugar in separate corners of the bread pan. Make a small indent in the centre of the flour (but not down as far as the liquid) and add the yeast. Set the bread machine to the dough setting; use basic dough setting (if available). Press Start. Lightly oil a baking sheet. Once the dough cycle has finished, place the dough on a floured surface. Knock it back (punch it down) and divide into three. Roll the pieces into equal ropes. Put next to each other. From the centre, braid from left to right, working towards you. Press the ends together and tuck under. Turn the dough around and braid the remaining ropes. Place on the prepared baking sheet, cover with oiled clear film (plastic wrap) and leave in a warm place to rise for 30-45 minutes. Meanwhile, preheat the oven to 200C/400F/Gas 6. Mix the egg yolk and water for the glaze together. Remove the clear film and brush the glaze over the braid. Bake for 30-35 minutes, or until golden.